Manufacturer: Hoover Co., of North Canton, Ohio. Hoover Co. is part of the Maytag Corp. Hazard: The recalled vacuums have defective on-off switches that can overheat the handle and toolholder areas of the vacuum, resulting in a fire hazard. Incidents/Injuries: Maytag has received 249 reports of vacuums overheating, which caused the handle area to smoke, melt or catch fire. One minor burn injury requiring no medical attention was reported. Description: Hoover Self-Propelled Upright Vacuum Cleaners are plastic, upright vacuums with the brand name "Hoover" and words "Self Propelled" printed on the front of the product. The model and serial numbers are printed on a label on the back of the vacuum. 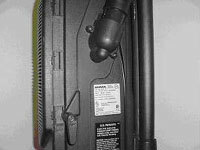 Only those Hoover Self-Propelled Upright Vacuum Cleaners manufactured between May 1998 and November 1999 are included in this recall. The recalled models include serial numbers 0598xxxxxxxx through 1199xxxxxxxx, with the first four digits of the serial number indicating the month and year of production (e.g., 0598xxxxxxxx is May 1998). Sold at: Household appliance and floorcare retailers nationwide from May 1998 through July 2000 for between $259 and $279. Remedy: Consumers should stop using the recalled product immediately and contact Maytag to obtain the name and address of the nearest Hoover repair center to schedule a free repair. Consumers should not return their vacuum cleaners to retailers.